With the UK due to open its doors to Romanians and Bulgarians from 1st January, 2014, we look back to 1892, when an earlier wave of immigration was causing consternation and became an election issue for the Conservative Party. The majority of the destitute immigrants referred to in the pamphlet, were Russian and Polish Jews fleeing the pogroms of the Russian Empire, which had been going on since 1881. ‘The mode of living of these immigrants is wretched in the extreme. Their food is of a poor nature, and they are able to maintain existence on much less than an English workman. They are for the most part an inoffensive race, and moral in their habits. In physique they are, as a rule, undersized, but their health is not bad, and they are capable of hard work. They are very industrious and work long hours for low wages’. 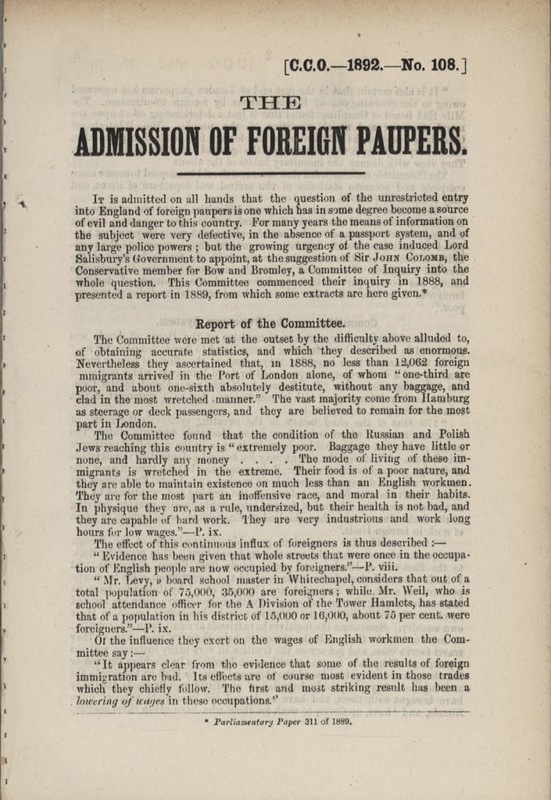 Although statistics at the time were unreliable, an estimated 12,062 foreign immigrants had arrived in the UK through the Port of London alone during 1888. Of these, about ‘one-third are poor, and about one-sixth absolutely destitute, without any baggage, and clad in the most wretched manner.’ By 1891, the total number of immigrants had reached 28,000. Salisbury, as Prime Minister, had appointed a Commission of Inquiry under the chairmanship of the Conservative MP Sir John Colomb, in 1888, to look into the problems of unrestricted immigration into the UK. Colomb reported in 1889 and, although he acknowledged that native English workers’ conditions had deteriorated as the result of foreign workers’ willingness to work for less pay, and that there was over-crowding with resulting insanitary conditions in Tower Hamlets, Mile End and Whitechapel, he was unwilling to recommend restricting the immigration of foreign paupers. ‘On arriving here they are quickly despoiled of any little worldly goods they may have brought with them, and have to depend for immediate support upon friends and have, as slaves, to work for those who have given them shelter, until six months’ residence qualifies them for relief from the Jewish Board of Guardians’. Any money they might have is ‘very soon cased by the loafers, and touts, and runners, that hang about the docks for the purpose of trying to show them lodgings, or a place to rest themselves for the night’. Testimony from the Rector of Spitalfields, subsequently the Bishop of Bedford, stated that some paupers were to be found working 19-hour days in sweat shops in return merely for shelter. 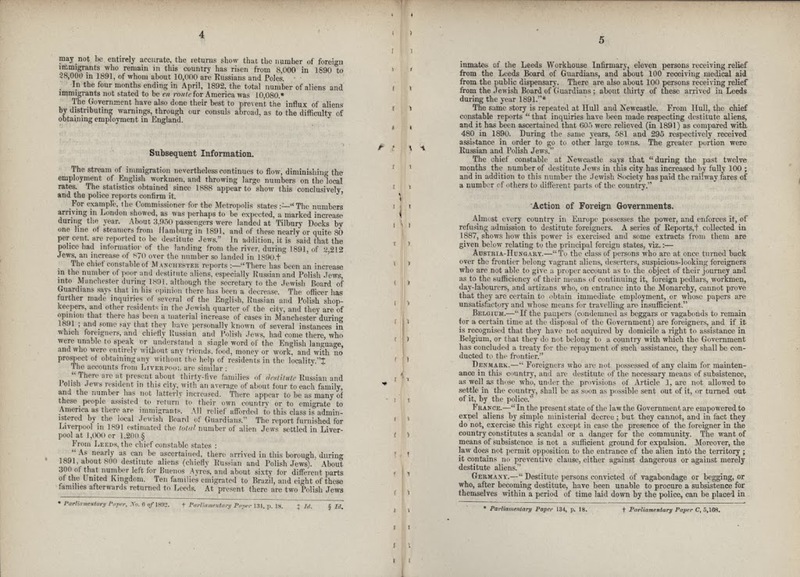 As the result of these various Inquiries, proper lists of immigrants arriving at ports around the UK were ordered to be kept for the first time. Similar increases in numbers of immigrants were being reported in Manchester, Liverpool, Leeds, Hull and Newcastle, although it was noted that as many as were staying in the UK were moving on to the United States, Brazil and Argentina. 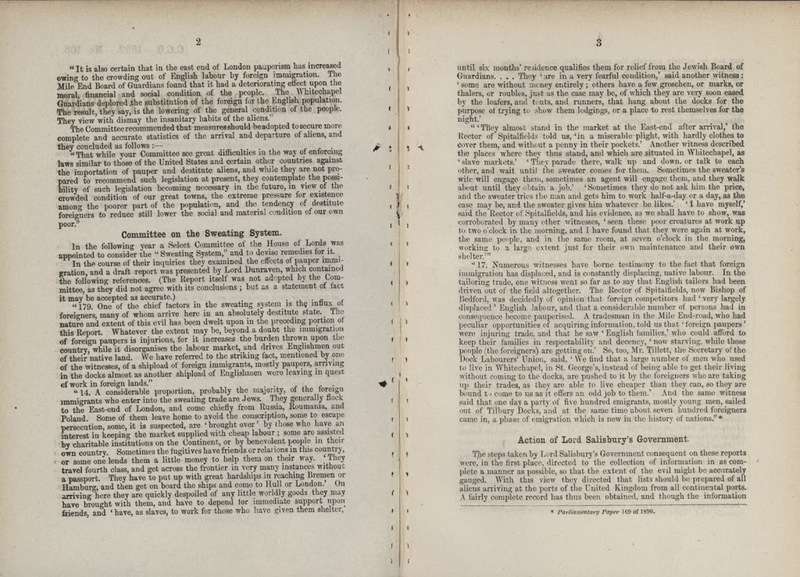 On May 6th 1892, Balfour stated in Parliament that the Government was considering legislation to deal with the problem, but although the Conservatives won the general election that July, they failed to secure a majority and Salisbury’s government was defeated within the month. 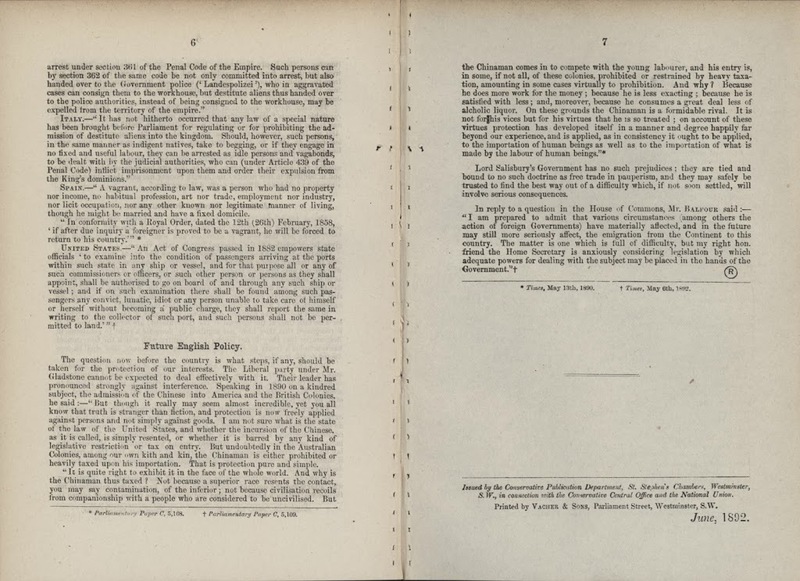 Immigration of foreign paupers continued to be an issue for British politics and what was probably the first restriction on immigration into Britain eventually came onto the Statute Book with the Aliens Act of 1905.